I originally wrote a short review for Mega Piranha, but I had to leave a lot out. Here's my full and extended review and summary of the movie. Despite the drubbing it took from critics, Mega Shark vs. Giant Octopus turned into one of the Asylum's most popular movies. When the time came to make a sequel, the Asylum tried to one-up Mega Shark and also capitalize on the release of another blockbuster movie, Piranha 3-D. 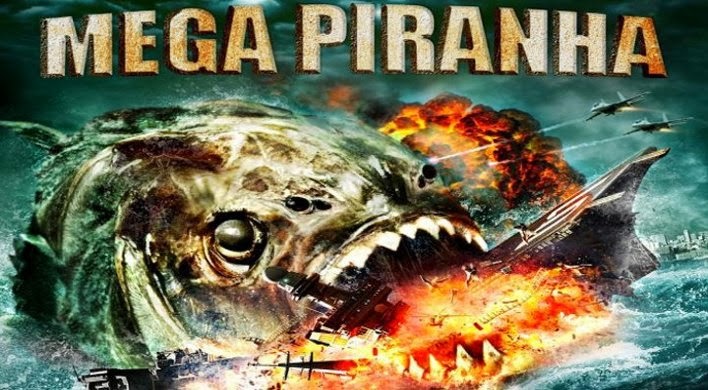 They came up with just a title: Mega Piranha. SyFy bought it just on the title alone. From there, the Asylum turned to Eric Fosberg, (screenwriter of such classics as Snakes on a Train, 30,000 Leagues Under the Sea and War of the Worlds 2: The Next Wave) to write and direct the movie. He did a surprisingly good job, given what he had to work with. According to Fosberg, the movie was shot in a breathtaking three weeks with only fifteen days of shooting. Usually, they only get twelve, but the Asylum spared no expense for this one. Except, of course, actual money. Some of it was filmed in California, but rainstorms forced the production to move to Belize. Trivia Bit: there actually is a prehistoric piranha called Megapiranha. This movie just uses that fact as a starting point, and doesn't really have anything to do with it. 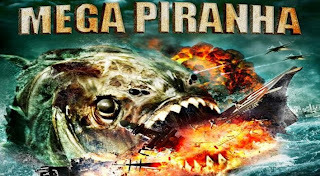 Mega Piranha is a spiritual sequel to Mega Shark vs. Giant Octopus. I say spiritual sequel, since it doesn't feature the same characters or plot, but it's clearly meant to be a follow-up. After all, how many movie studios have produced two movies about gigantic man-eating fish with the word "mega" in them? Of course, let's be clear that there's a reason this movie went straight to video. It's strictly low-budget B-movie stuff, only for the die-hard sci-fi movie lover, so it's unfair to compare it to something like Avatar. So let's ask this: is it better than Mega Shark vs. Giant Octopus? The answer is yes. Sort of. Let's take a look. The basic plot is that a pack of genetically engineered giant piranhas escape from a lab and brings terror along a river in Venezuela. When they kill the US ambassador of Venezuela, square-jawed special agent Jason Fitch (Paul Logan) is sent to investigate. There he clashes with Colonel Antonio Diaz (David Labiosa), a maniacal Venezuelan military commander trying to stop him from uncovering the truth; that the piranhas are a genetically-engineered experiment that escaped from a lab. 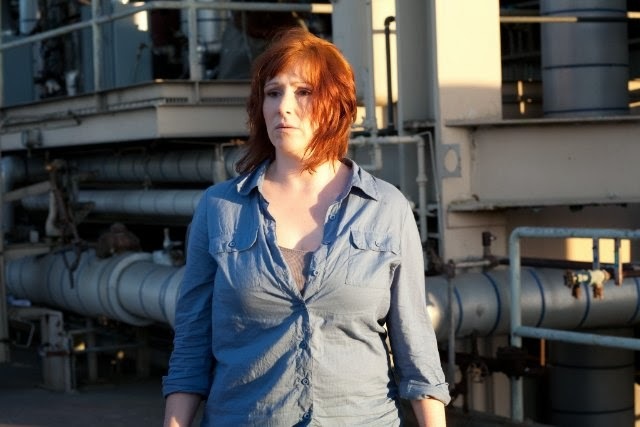 The team of scientists who created the mega-piranhas, led by Sarah Monroe (Tiffany), race to try to stop the piranhas before they reach open water and spread across the world. The movie begins with some obligatory T&A in the form of a yacht full of bikini-clad babes on a river in the Amazon. It seems that the US ambassador of Venezuela is on a boating trip with a Venezuelan diplomat. And what better way to entertain a US diplomat than by a lovely excursion down a piranha-infested river? The babes themselves are an oddly diverse ethnic group of women. I guess the Venezuelan diplomat wanted to cover all the bases. It doesn't take long before the action begins when the mega-piranhas attack and sink the boat, devouring everyone on board. At this point, I was worried, but relieved to see the special effects are definitely an improvement over Mega Shark. Whereas that movie recycled its meager CGI shots of the creatures in endless loops, Mega Piranha actually shows us numerous and generous CGI of the killer fish. 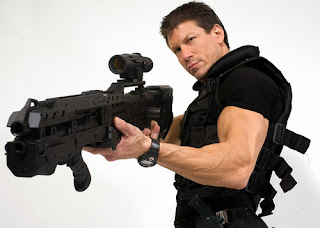 Now that we've got the setup, it's time to meet our hero, Special Agent Jason Fitch. I got the impression that Jason Fitch was intended to be a series character. Thankfully, I haven't seen any more movies with him. Fitch is a walking cliché whose sole purpose is to talk in a gruff voice, dress all in black, and perform pedestrian acts like driving cars or scuba diving as if they were death-defying feats. Fitch is called into action by Senator Bob Grady, played by Greg Brady himself, Barry Williams. This led to one of my favorite moments in the movie, when they introduce Grady on a video phone call to Fitch. The call starts with Senator Grady facing away from the camera and spinning around to face it in a very dramatic fashion. However, it did make me imagine the moment before with the senator sitting down, facing away from the camera, and then saying, "Okay, turn it on" to the wall behind him. I guess drama is important. Senator explains that the death of the US ambassador could have been a terrorist attack. Not sure how a guy getting chomped to bits could be labeled a terrorist attack, but Special Agent Fitch is on duty! Fitch arrives in Venezuela, and this is one of my favorite B-movie moments. We know that he's outside a Venezuelan airport because there's a sign that's literally drawn on a piece of paper with a felt-tip marker and stuck on a wall in the background that says "Venezuela Airport." No expense spared. The Venezuelan officials who meet Fitch start talking in Spanish, at which Fitch announces that he doesn't speak Spanish. Probably something you would want in a special agent on a mission to South America, wouldn't you think? It really made me wonder what made them think Fitch was the right man for the job. Before they get too far, the greeting part is interrupted. In another callback to Mega Shark, they hired an eighties pop star to play a lead role. In Mega Shark, they hired Debbie Gibson. This time, the Aslyum brought in Tiffany as Sarah Monroe, the standard B-movie rogue scientist that no one believes. At this point, I was kind of disappointed, because the piranhas were merely the size of a small dog. But then it turns out that the mega-piranhas double in size with each generation. Throughout the movie, they get bigger and bigger until by the end, the mega-piranha are the size of whales. We see giant piranhas attack everything from swimming lovers to a nuclear sub. If all you want is giant fish eating people, this is your movie. Here, we meet the movie's villain, Colonel Antonio Diaz. He continues to insist that the US ambassador died from a terrorist attack and flies Fitch out to the river to investigate. During the flight, Colonel Diaz rants to Fitch about how the US treats Venezuela like a child. This is a continuing theme throughout the movie with the hostilities between the US and Venezuela as a source of tension. I was impressed that they tried to make some sort of political statement alongside the blood-filled water. I thought Tiffany did a really good job in her role as Sarah Monroe. Of course, it's not winning any Oscars, but it gets the job done. As both the creator and enemy of the mega-piranha, her role is a little more complex with some guilt rolled into her heroism. Sara Monroe explains to Fitch that she created the mega-piranhas as a way of feeding the world. I guess the idea is to create large animals that are tough, larger, and self-sustaining, so more people can eat them. At some point, someone should have explained to Monroe that maybe breeding giant piranhas isn't the best way to feed the world. I don't know too many people who chow down on piranhas. Maybe start with breeding giant chickens and go from there. Now there's a sequel for you…Mega Chicken! Asylum, are you reading this? You can have that one for free. At this point, the Venezuelan politics become a distraction with Fitch spending more time fighting Diaz than the mega-piranha. He gets arrested and imprisoned, but promptly escapes and crab-runs past armed guards in broad daylight with no one noticing. Fitch manages to get to the river and engage the mega-piranha in hand-to-hand combat. Yup, you heard me right. For some reason, the mega-piranha decide to leap out of the water and attack Fitch in mid-air. You actually get to see a guy bicycle kick a giant piranha in the face. What more could you want out of a movie? Monroe explains that the mega-piranha will double in size with every generation. The mega-piranha can even impregnate themselves and reproduce. If they escape into the open ocean, they could overrun the planet. Now that's what I call tension. It's time for our heroes to hunker down and figure out a way out of this mess. But one area where Mega Piranha failed in comparison to Mega Shark is logic. As hard as it is to believe, a movie about a giant shark leaping out of the ocean to bite a plane in half made more sense than half the stuff in this movie. Exhibit A is where one of the scientists insists that sensible solutions like using electricity or acid on the piranhas is too dangerous because it will only lead to more mutations. I found myself screaming at the screen, "How? Why?!" Clearly this was done to stretch out the plot, because if we simply blow them up, the movie is over. But the mega-piranha's weakness is vague at best, inconsistent at worst. It makes sense that a shark the size of an ocean liner would be hard to kill, but not a piranha the size of a horse. Also, only minutes earlier, Fitch was able to stab a mega-piranha to death with a regular knife quite easily. But Colonel Diaz doesn't listen to the scientists and decides the best way to solve the problem is to blow the river up with rockets. Frankly, first smart move anyone has made up until this point. Yet instead of killing the mega-piranhas, the rocket attack destroys the dam and allows the mutant fish to escape the river and head for the open ocean. D'oh! One thing about Mega Piranha is that it delivers. We get to see the Venezuelan coast in chaos with giant piranhas leaping from the river, eating people whole, and crashing through buildings. Trivia Bit: The same actor who yelled "Holy--" at the Mega Shark airplane attack is the same actor who yells "Holy--" at the Mega Piranha attack. One would think such a threat to his people might snap Diaz out of his vendetta against Fitch, but no. We watch a weak car chase instead, leaving me grumbling, "Get back to the piranhas already." At this point, I found Colonel Antonio Diaz more annoying than threatening. The best part about this car chase is that it's clearly multiple car chases edited together. At some points, Fitch is driving a Toyota Camry, and in others he's driving a Hyundai Elantra. Likewise, at different moments, Diaz is driving a GMC Jimmy, Chevrolet Suburban, Suzuki XL7, and a Ford Explorer. The editor was just phoning it in. Speaking of editing, I should probably say a few words about that. Almost every change of location is done with a swooping jump cut, a montage with fast motion, and the location typed out like an episode of 24. While this can be cool, they really overdo it in this movie to the point of exhaustion. After a while, I just want to cut to the scene and move on. Of course, it wouldn't be a giant creature B-movie without someone suggesting a nuclear bomb. Oddly enough, the guy who insisted that simple poison was too dangerous to use on the mega-piranhas has no problem with a nuclear bomb. They use a nuclear torpedo (do we have nuclear torpedoes?) on them, but the explosion leaves the mega-piranhas without a scratch. Amazing. At this point, the movie avoids one of the fatal flaws of B-movies, where they show something awesome on the movie poster than never happens in the actual movie. You know that poster where it shows a mega-piranha biting a battleship in half? We actually get to see a mega-piranha biting a battleship in half. Well played, Mega Piranha. Well played. The stakes are raised when the government decides that if they can’t stop the mega-piranhas, they’ll nuke the whole eastern seaboard to stop them. The climax of the movie is an undersea battle between Navy SEALs and the mega-piranhas. The SEALs use underwater machine guns to blast away at the mega-piranha to no avail. 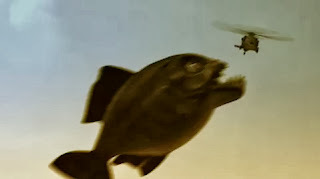 In a great moment, Fitch gets a mega-piranha to leap out of the water and destroy a helicopter with Colonel Diaz in it. 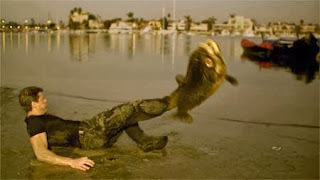 Take that, Mega Shark! And now for one of the most nonsensical endings I've ever seen. Fitch finally figures out a plan to kill off the mega-piranhas. Since the creatures are cannibals, all they have to do is get one of them to bleed, and the mega-piranhas will devour each other. In a nod to Jaws, Fitch is able to blow the same mega-piranhas in half by shooting an oxygen tank in its mouth. The mega-piranhas turn on each other in a bloody scene of carnage. I couldn't believe it when the heroes walked off in slow motion and ended the movie. Do I need to point out why this wouldn't work? Apparently. Earlier in the movie, they established that the mega-piranha can impregnate themselves. Even one mega-piranha is a threat. So the scenario that would play out is all the mega-piranha devour each other, except for one, since it can't exactly eat itself. That one mega-piranha starts breeding again. Welcome back, mega-piranhas. But let's let that go. The bottom line is that Mega Piranha is overall better than Mega Shark vs Giant Octopus, but that's not saying much. Almost any other movie I can think of would be. So here's my rating. What did you think of the review? Would you watch Mega Piranha? I've only caught snippets of this one. Sadly, I have seen all of Mega Shark. Breeding giant piranha to feed the world was a bad idea. I watched a Riff Trax movie the other day that was a really bad 70's film. Ironically, it was of better quality than most SyFy movies. I agree with Alex on Tiffany...."I Think We're Alone Now"...yes she is a long way from the 80's! I am sorry, I can't believe you sat through that. I couldn't! You have to love how Syfy has so expertly refined their formula for dreck.